Janak Mehta – known as a Facebook Advertising Ninja and a Paid Advertising Expert; is a passionate Entrepreneur who thrives on serving, consulting and training business owners and organizations on how to get scale traffic to their website and turning visitors into clients/customers and grow their business. Janak Mehta is the co-founder of Client Online (Formally PR Easy), a full service Social Media Marketing & Advertising Agency based in Scottsdale, AZ. Clients Online helps Experts, Information Marketers, Service Based businesses with Facebook Advertising, Google Pay-Per-Click, Social Media Marketing & Paid Advertising Campaigns and various other marketing strategies to help them grow their business. Janak Mehta was born in India and moved to the US to earn his Masters in Information Networking, an interdisciplinary degree from School of Computer Science, Electrical Engineering and Business School at Carnegie Mellon University. He then worked at Bell Communication Research Lab (Now Telcordia Technologies) and Ford Motor Company. While at Ford, he started a real estate investment business, buying and selling $2.4 million in property across US. He also launched the Local Real Estate Investors Club, growing it to over 300 members. Janak left Ford in 2007 to scratch his entrepreneurial itch. He started PReasy.com to help businesses get massive results via the web, using his unique process that gives results to his clients! Janak has hosted live events like Internet Marketing Made Easy, Michigan Marketing Makeover and Sales and Marketing Live, where he shared the stage with the best offline and online marketing experts. In addition to speaking at his own events, Janak has presented online marketing strategies at live events like Matt Bacak’s Marketing Madness in Atlanta, GA and E-Commerce Summit, in New Orleans, Louisiana. Janak has also taught an internet marketing course at Wayne County Community College and regularly presents on topics like “7 Steps To Become Google-icious” and “Social Media Marketing For Businesses.” You’ve seen him at Automation Alley, Michigan’s Entrepreneurs Network, REIA OF Michigan, Rotary Club, Plymouth Chamber of Commerce, Revenue North, TiECon Midwest, Entrepreneur Success Bootcamp and Downriver Small Business Conference. 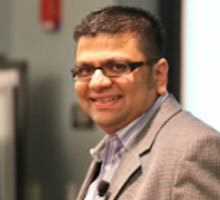 Janak is teaching Facebook Advertising 101 course at Washtenaw County Community College as a part-time faculty. He hosts live monthly social media marketing trainings at Social Media Michigan’s Troy & Livonia chapters in Michigan. He also co-hosts Michigan Business Growth events each quarter. Need more? Janak served on the board for TiE (Talent, Ideas, and Enterprise) Detroit, the world’s largest entrepreneur’s organization. He’s a contributing author for the recently published book, Overcome Everything, with Bob Burg, Ken Blanchard, and Oprah Winfrey. When he’s not marketing, and speaking, Janak is also writing a book on Online Marketing Strategies to be published Fall of 2017. 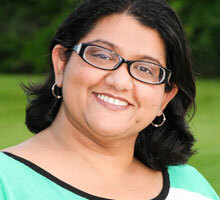 “Social Media Gal” Urvi Mehta co-founded Clients Online, with her husband Janak. Passionate about social media marketing, Urvi thrives on teaching business owners and organizations to use social media marketing strategies and tools like Facebook, Twitter and LinkedIn to create buzz and build influence online. Urvi is a master at teaching entrepreneurs how to build authority using social media, which drives big bottom line results. She works with business owners and organizations to create a client attractive social media presence that attracts followers, fans and valuable business connections, all within a few months. A skilled teacher, Urvi Mehta reveals techniques for marketing a business via social media that work as well for the newbie as a seasoned internet marketer. She has spoken at Shawne Duperon’s Media Mastery Bootcamp, gives online webinars and is a contributing author for the recently published restaurant marketing book, “Full”. When she’s not busy marketing, speaking and teaching, Urvi is also writing her own book, co-authored with her husband Janak, on Online Marketing Strategies, to be published Fall 2017. The Power Of Facebook Advertising & Marketing? Click the button and follow the instructions to start the conversation! Disclaimer - This site is not a part of the Facebook website or Facebook Inc.Additionally, This site is NOT endorsed by Facebook in any way. FACEBOOK is a trademark of FACEBOOK, Inc.